Have you been noticing your cat claw at itself every now and then? That is not quite normal, something must be itching to make it scratch so much. Perhaps it is time to check it out for fleas. If your cat has fleas and you don’t do something about it, it is only a matter of time before the infestation becomes a health hazard. Since your cat most likely stays indoors, the fleas will soon realize that the standard of living in your house is better than on the cat. Now, the problem just got real. A home infested with fleas is not fun. Asides the health hazard they pose, they are also a menace to accommodate and get rid of. Flea collars are one of the ways to treat and prevent flea infestation on your cats. They are designed just like those regular collars that make your cat look a little fancier. These collars are fortified with insecticides, and they release a small dose of it along the cat’s body to kill off the fleas on it. The insecticides are released in doses that are not toxic to your cat making it safe for it to wear around. These collars often offer long-term protection for your cat. Some will stay protective for up to 8 months before you will need to change it. So, you can rest assured your cat will not be bothered by fleas or ticks for that long. What are the active ingredients in the collar? Some collars are treated with insecticides such as Fipronil, Etofenprox, Propoxur, Tetrachlorvinphos, etc. These ingredients are known to be potent insecticides. Some collars use a combination of them as they are synergistic (they work together to enhance their efficacy). We all know insecticides are toxic to humans and animals but they are released in such tiny doses they are only detrimental to insects. Some brands of these flea collars choose to go the natural way by using only a combination of organic essential oils to repel those pesky insects. The oils they use range from the oil of Eucalyptus to Cinnamon oil, Citronella oil, Linaloe wood oil, etc. Whether the collar uses insecticides or organic ingredients to get its job done, the fact remains that these collars are safe for your beloved pets. If they were not, they would not have been approved for sale. Before buying any product, it is important to be clear on why you are buying and how you intend to use it. You have a better understanding of your needs so just use the following as pointers to guide your decision. Cats come in all sorts of sizes and some grow faster than others. These flea collar brands claim that their collars are adjustable and can be used on most cats. Truly, they are adjustable but they still come in different sizes. You should know the size of collar to buy as one with a kitten will definitely need a different size from someone that has an adult, chubby cat. The type of collar is another important consideration. 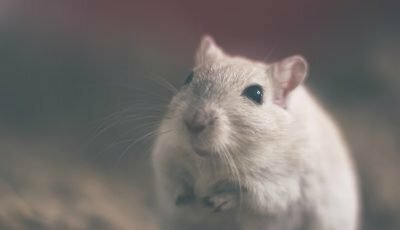 Some pet owners would not want any form of chemical near their furry darlings. So, those ones will prefer the collars that use all-natural ingredients. On the other hand, some pet owners will not mind the insecticide-treated collars on their pets especially since they are safe. Most insecticide collars repel a wide array of insects and even kill larvae too so the infestation is cleared completely. The duration of the protection the collar provides is another factor to consider especially since this one tends towards saving money. All the flea collars we have on our list are effective, so you might want to consider the ones with the longest duration of protection it offers your pet. Some brands have two collars in their package, this might be a great money saver depending on how long the protection it offers is. Quite a number of the flea collars we featured on our list can be used both for treatment and protection. This is a solid advantage as you will not need to spend extra on treatment. The active ingredients in the flea collars are so potent they will kill fleas and ticks on contact. Most of them even go ahead to kill the larvae so they won’t make it into adulthood. These collars are also effective at repelling several other insects too. Apart from ticks and fleas, lice and mosquitoes afflict cats too. These flea collars keep them and many other types of flying, biting, and disease-carrying insects away from your cat. They are easy to use too. There is no special way to wear these flea collars, it is just the same way you wear the regular ones. Just put it around the cat’s neck, adjust it to a snug fit with the buckle. If there is an extra length sticking out, just cut that off and your cat looks a lot trendier. When your cat has been treated of its flea and tick infestation, it is ideal to take measures to prevent it from happening again. That is the beauty of these flea collars. It is the same one that treated it that will continue to protect it. Quite a number of these flea collars offer protection for up to 8 months. Some offer less, but whichever one you go for, just make sure it serves the purpose you need it for. The disadvantage you might encounter using these collars have to do with taking the right precautions. This is why it is important to always read the user manual before applying these products. You should wash your hands after you’re done. Make sure your pet does not do a chewing practice with this collar. And be sure to keep it away from kids so they don’t play with it. It is safe for pets does not mean it can be ingested by humans. We believe that with the above guide you now have a good amount of knowledge about flea collars for cats. 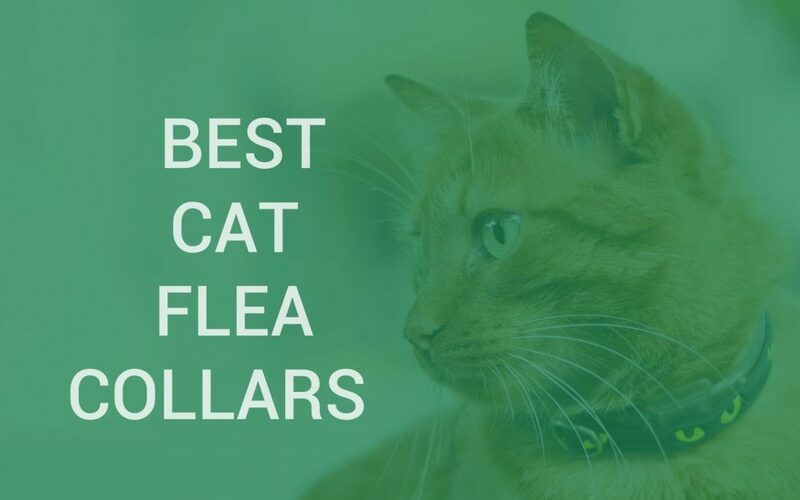 This knowledge coupled with your understanding of your cat’s situation will make it easier for you to choose from our list of trusted cat flea collars. Read on and select the best flea collar for cats that your feline friend will absolutely love. Ekoprom is a scientific production company that has grown from strength to strength over the years while bagging many awards. Its business principle is fairly simple; reliability and responsibility. Those principles are shown in its products which includes Rolf Club Flea Collar for Cats which we are featuring. Another great thing about this company is that it practices open communication with its partners and customers and uses their feedback to better its products. This is why Rolf Club products keep getting better with every iteration. The featured product is one of the best flea collars for cats which is why we are talking about it and is a typical example of Ekoprom’s principle of reliability and responsibility. This cat flea collar uses three active ingredients (which are known as powerful insecticides) to kill ticks and fleas in a short period of time. It is also effective in preventing them from latching on to your pets again. Not only is it potent against adult insects, it will also kill the larvae to make sure they do not hatch into new fleas or ticks. This protective cat collar is non-toxic and will not pose any safety hazards to your pets or you and your loved ones. It will not cause rashes nor does it have any lingering odor that might disturb your cat. It is easy to wear and easy to adjust. Once you put it around your cat’s neck, just adjust it with the buckle and fit in place. It is important that the collar fits snugly around your cat to get the maximum effect. If there is excess collar length sticking out, you can cut it off for a neat appearance. This collar will work on any breed of cat or any size. 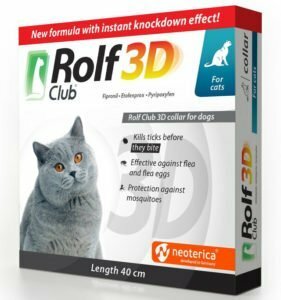 The Rolf Club Flea Collar is a new design with a potent formula for treating and preventing flea and tick infestation in cats. It is waterproof and will keep protecting your cat for up to 8 months. Be sure to wash your hands (after wearing it on your cat) with warm water and soap. For those that are hypersensitive, it is better you do not come in direct contact. Make sure your pet does not eat this collar as it will result in poisoning and also ensure you keep it away from the reach of children. Important note: There is a smaller version suitable for kittens up to 1 year which is also as effective. Pet Club Brothers is a company focused on the welfare of pets. Over the years, it has been offering some of the most innovative and practical solutions for pet and pet owners. It has become a widely recognized brand when it comes to pet products. Its dedication to offering only the best pet products have obviously paid off in trust and reliability from its customers. 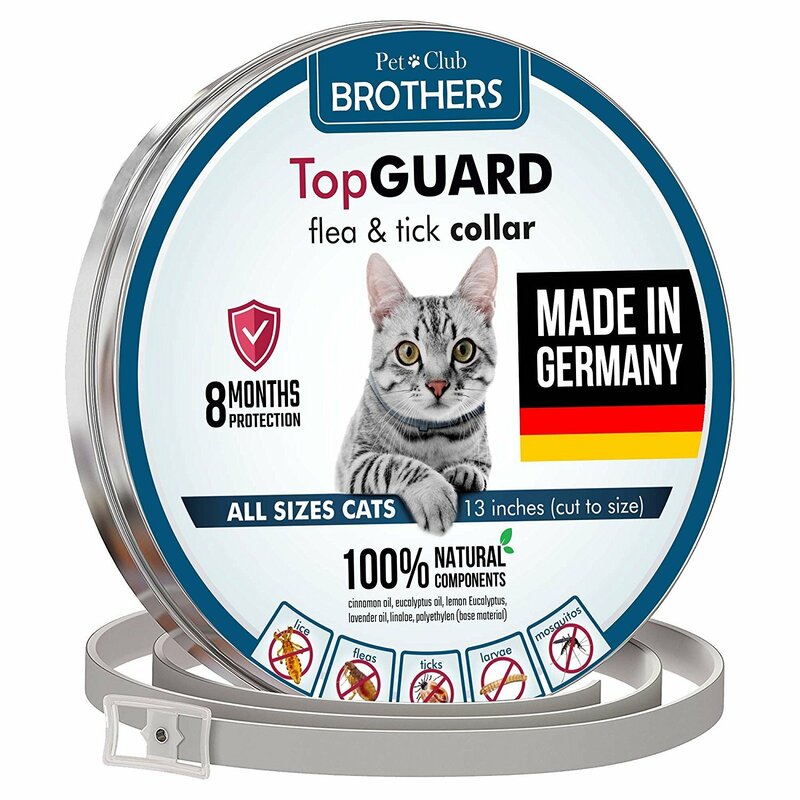 Its flea collar for cats offers reliable treatment and protection for cats without the use of insecticides or harmful chemicals. It uses only organic ingredients to fortify the collar and it does a fantastic job keeping insects away. One good thing about this product is that it is not just potent against fleas and ticks. The manufacturer says that the collar offers your cat reliable defense from 500 different species of insects. That is a lot of protection and your cat will not be bothered by insects as long as it has this collar on. Talk about royalty. It is safe for your cat as it uses 100% organic ingredients. It is also hypoallergenic so it won’t be triggering any allergies in you or your cat. The environment is also well protected as this protective collar is also eco-friendly and will not damage the environment if properly disposed of. This collar is 13 inches long which will fit most cats. It is easy to wear as you just place around your cat’s neck and adjust to a snug fit, then buckle in place. If there is any excess length, you can cut it off. Do note that the collar needs to be properly fitted around the cat’s neck for optimum effect. It also should not be too tight. It is advised that you leave about 2 inches of a gap around the neck for further adjustment. This collar will protect your pet from insects for up to 8 months and it can even be used on kittens that are up to 7 weeks old. The collar comes in a metal container protected in a sealed aluminum wrap to keep its potency. It is also waterproof but it is not advised to always get it wet as that might reduce its effectiveness and durability. It is better safe than sorry. So be sure to keep this product away from children and do not allow your pet to chew on it. You should also remember to wash your hands after using this collar on your cat. Beloved Pets is a distinctive brand when it comes to pet care products. It offers quality and innovative solutions to pet owners. With a special focus on animal safety and comfort, Beloved Pets manufactures products that are safe for use for the sake of your pets’ health as well as yours. 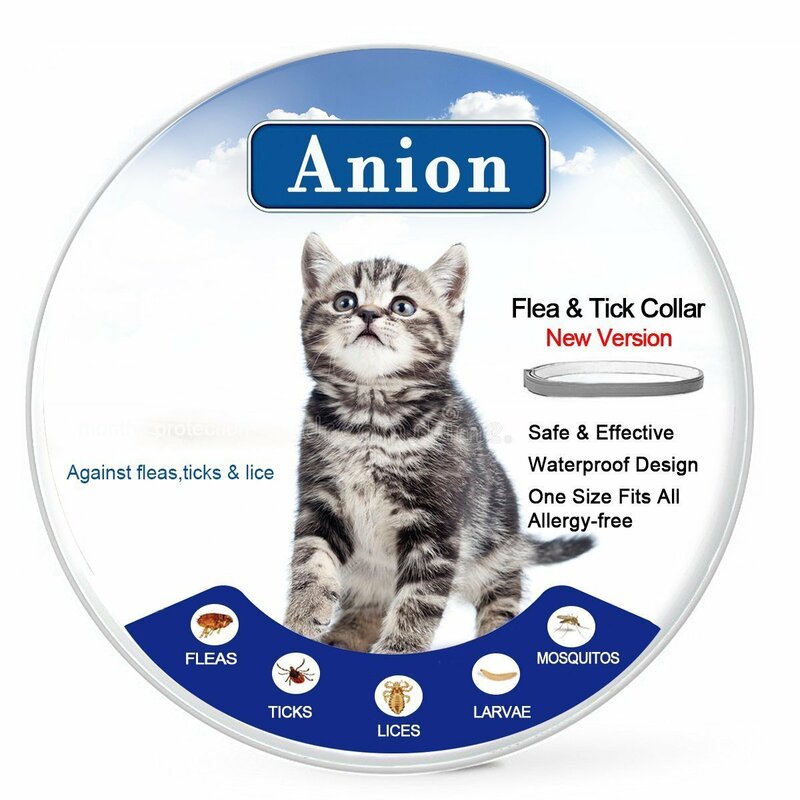 Its tick and flea collar is particularly effective because the collar is treated with propoxur which is a non-systemic insecticide which has a quick knock-down effect on insects. This means it is fast acting and those pesky insects, especially fleas and ticks, will not be able to live off your pets again. This active ingredient also works against other types of insects such as mosquitoes, moths, ants, etc. The flea collar is easy to wear on your cat and is adjustable with the buckle. Furthermore, it can fit different sizes of cats and comes in two sizes, medium and small. You can choose which size to go for depending on your cat. For maximum effect, the collar has to fit snugly on your cat, but not too tight. You wear it such that 2 to 3 fingers can still come in between the collar and your cat’s neck. After getting the right fit, you can cut off the excess part of the collar. Note that it is available in Green and Orange colors so you might want to ask your cat what color it prefers. The collar is also safe as it does not contain any harsh chemicals that can be toxic to you or your pet. It will not cause rashes not does it have any smell your cat might react to. Apart from killing fleas and ticks that might already be on your cat, it also protects your cat from further infestation. The protection this collar offers last for up to 4 months when you might need to swap it for a new one. Be sure to read the instruction manual before applying this product. This will keep you and your cat safe and help you get the best out of the product. Do not let your cat chew on the collar and keep it out of the reach of children. The manufacturer is so confident that this flea collar is backed by a 100% satisfaction guarantee. This is a clear evidence of how well you can rely on this product to deliver the result it has promised. This is one of the reasons this brand was able to make it on our list. Some users consider it the best flea collar for cats. Artswow is a popular pet brand with years of experience in animal handling and welfare. It caters to pets large and small and creates practical solutions for their well-being. Its effective products will help keep your pets safe and healthy. 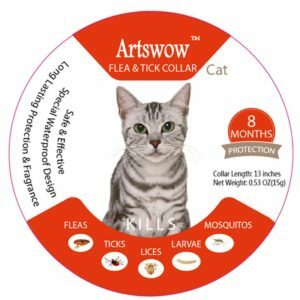 Artswow Flea and Tick Prevention for Cat is one such product that even cats have come to love. This particular one is treated with 2 potent active ingredients that make it so effective at treating and preventing tick and flea infestation on your pet. Tetrachlorvinphos is one of the active ingredients which is an organophosphate insecticide that is known to be potent against fleas and ticks. It kills them and further prevents them from infesting your cat again. The Methoprene is the other ingredient. It is not meant to kill the insects but to mimic a natural insect growth regulator hormone. This substance works to prevent larvae from turning into adult fleas or ticks. 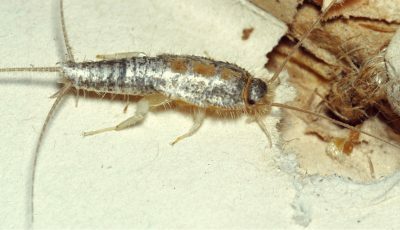 Since the larvae cannot metamorphose, it will eventually die off. The trick here is that adult insects die and larvae can’t turn into adults. This simply means a complete eradication of fleas and ticks. We were serious when we said this list contains some of the best flea control for cats. The collar does not contain any toxic chemicals, so it is safe for your pet. You don’t need to bother about rashes or allergies as this flea collar is hypoallergenic. One awesome thing about this product is that it is water resistant and you might not need to take it off when bathing your cat or it goes for a quick dip. The collar will still continue to be as effective as ever. The collar will keep your cat protected against fleas, ticks, and other insects for as long as 8 months. The collar is adjustable and easy to wear. When you put it around the cat, you can get a snug fit by using the buckle. Just make sure to leave about 2 inches or 3 between the cat’s neck and the collar. The snug fit helps the collar stay effective and you won’t find your cat scratching at its neck again. Always read the user manual to stay safe and get the best out of the product. The manufacturer has a 100% guarantee on this product claiming you can apply for a return if you are not satisfied. Seresto is a registered brand of Bayer, which is a globally acclaimed pharmaceutical and life sciences company. Seresto is a popular pet brand that is relied upon and trusted by pet owners all over the world. Not only because of its affiliation with Bayer, but also its consistency in offering superior quality products that enhance the welfare of pets. 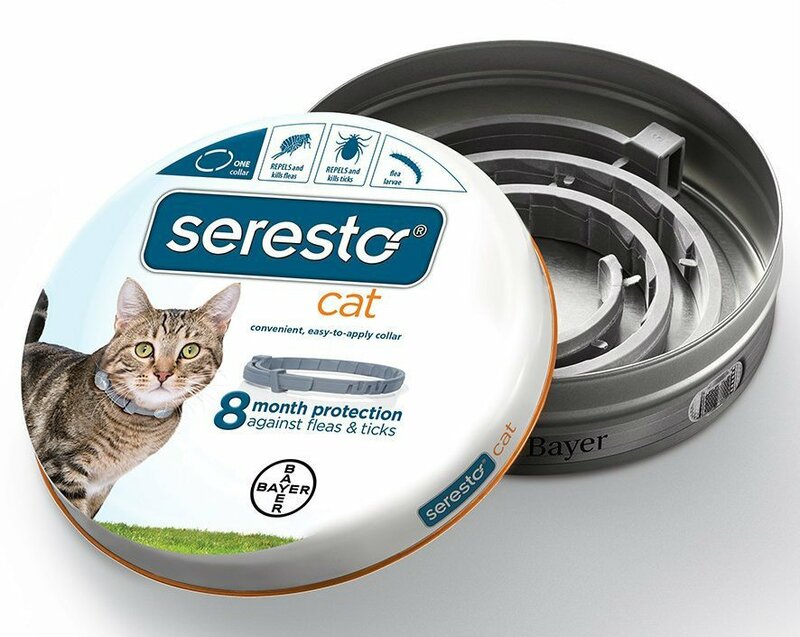 The Bayer Seresto Flea and Tick Collar is an amazingly effective way of treating and protecting your cat from flea and tick infestation. 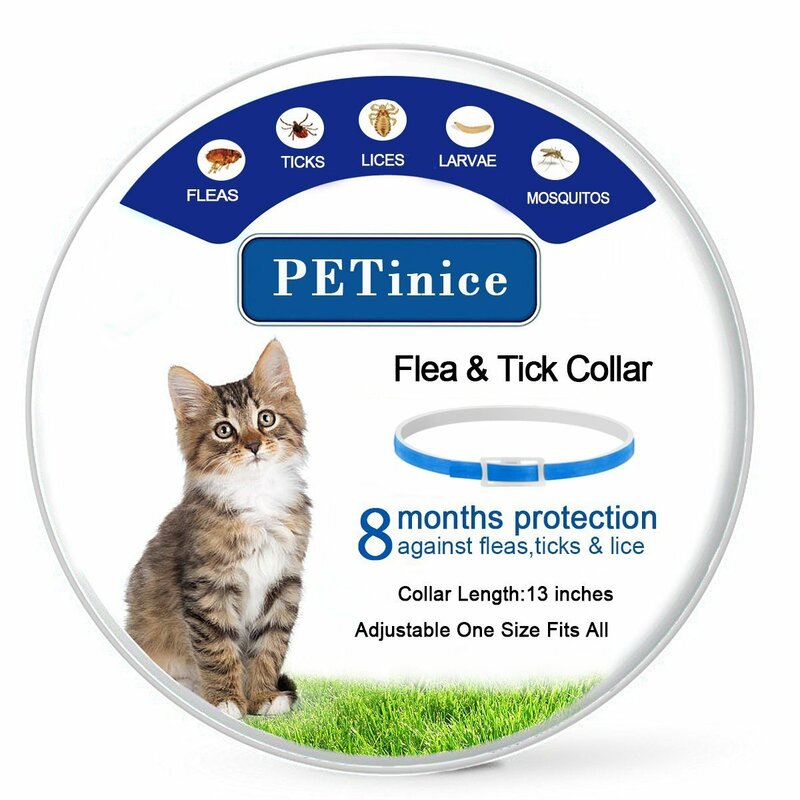 Not only will this collar kill adult fleas and ticks already on your cat, it will also kill the larvae so they do not cause a further infestation. Furthermore, it keeps a barrier of protection around your cat so those blood-sucking insects don’t latch up to your pet again. This is a great method to keep your pet safe and healthy as it greatly reduces the chances of your cat taking ill because of the diseases those insects peddle. One thing this brand of the protective collar has going for it is how safe it is for both your pet and your family. This product has been rigorously tested and certified safe to be used on cats, even those as young as 8 weeks old. It is also considered safe to be used in combination with other topical pest control solutions. The active ingredients for this product are carefully selected. They are specifically active against insects and parasites. That way, only small doses are needed for them to be effective. This is one of the reasons the collar is so safe as the dose the collar is designed to release is only harmful to insects. The active ingredients used are also synergistic to one another which means they make other ingredients stronger. This is why this Seresto flea collar for cats is so effective at killing fleas, ticks, and their larvae. It will continue to protect your cat for up to 8 months before it needs to be changed. 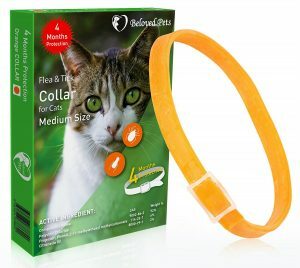 This could possibly be the best flea collar for cats in your home as it is easy to wear, it does not have any odor your cat might not like, it is non-greasy, it provides quick protection, and most importantly, it is comfortable. It is highly recommended by veterinarians as a reliable brand that offers long-lasting protection for your cats. Another pretty feature of this Seresto cat collar is that it has reflective clips that allow you see your cat in the dark. Totopet is a pet brand that obviously loves pets. It is obvious simply because of the amount of effort it puts into its product. With research and innovation as the background for developing its products, little wonder they are of high quality and offer practical solutions. 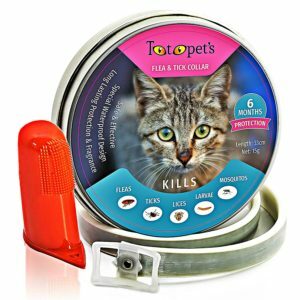 The Totopet Flea and Tick Collar for Cats and Kittens is an obvious evidence of the brand’s commitment to pets’ wellbeing. This kitten flea collar is effective at offering treatment and prevention for your favorite feline against ticks and fleas. It contains a phosphate-based active ingredient that kills adult insects as well as their larvae. This is an excellent method of clearing infestation and preventing future ones. This cat flea collar will continue to protect your cat from fleas for up to 6 months of wearing the collar before it needs to be changed. That is a whole half a year your cat will be free of those nasty bloodsuckers and their awful diseases. The collar is easy to wear. It is just like any other type of collar your cat has been wearing in the past. It has an adjustable buckle which helps you get a snug fit and makes this collar usable on cats of different sizes. If the collar turns out too long for your cat just adjust it to fit snuggly and cut off the excess. You do not have to worry about rashes or allergies as this collar is designed to be hypoallergenic. It is also water resistant and will not lose strength when your cat gets wet. It is safe for your pets and also safe on the environment. The collar is so comfortable your cat will feel at ease with it. Some cats are quite sensitive and will be put off by any smell they find repugnant. This collar does not have any smell cats will find repulsive. So, once you wear it on your cat, it stays on and continues to offer its protection. There are safety procedures you need to follow which is why it is important to always read the product manual. Reading it will also show you how best to apply this product to get the best result from it. Finally, you will have to wash your hands after fixing this collar on your cat and do not let it take a bite. Be sure not to let kids play with it talk more of getting it in their mouths. Oxo Pet Products is a large distributor of top-quality and innovatively designed pet paraphernalia. It is largely interested in pet safety and welfare. This is a brand with numerous products you can trust. It has been serving pets and pet owners for years and they have all been happy with it. This is a brand your pets will thank you for patronizing. Its PETXO Cat Flea and Tick Collar is a highly effective flea control for cats. It helps to prevent ticks, lice, fleas, and even their larvae so your pet won’t be used as a breeding ground. The essential oils this collar is fortified with help keep away the insects that prey on cats. The concept of a collar is also ideal considering that the neck area is where ticks prefer to hide. This cat flea collar is easy to use as you just need to wear it on your pet like you do any other collar. It is adjustable with the fitted buckle. 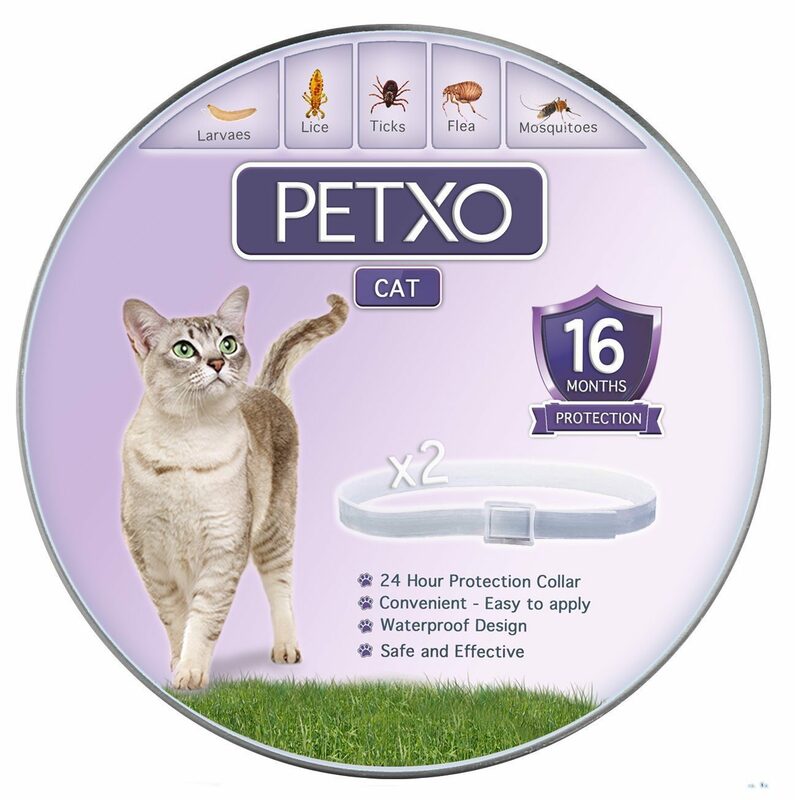 You don’t need to bother how big or small your cat is, this protective collar would fit. If there is excess length, you can cut it off to have a nice and neat fit. When wearing on your cat, be sure to wear the collar loose such that there are inches of space between the collar and the cat’s neck. There are no insecticides or harmful chemicals on this collar so there are no safety concerns here. It is totally safe for the pets. This collar is also waterproof so you don’t need to bother about keeping your cat away from wet conditions. However, the manufacturer suggests that the waterproof status does not justify it getting soaked all the time. The more often it gets drenched, the less powerful it gets and the less its durability. This flea and tick collar for cats come as a pair in the package. So, if you have 2 cats one pack is enough. Even if it is just one you have, the collars are tightly preserved in an aluminum bag to keep the potency for up to 2 years. One of these collars will keep your cat protected for up to 8 months under normal conditions. Considering the shelf life of this product, the other collar will still be fully potent by the time you will need it. Kindly be sure to prevent your pets from chewing up on it and to keep it out of reach of children. This collar is also not recommended for cats that are 10 weeks or younger. If you have a pregnant cat, sick or old ones, do consult your veterinarian before using this collar. Petinice is a brand that’s specialized in creating products dedicated to pets. It has remained in business over the years by offering only high-quality and reliable pet products. It does this so consistently that pet owners have come to trust it to deliver all the time. This is how the brand has earned its reputation. If it continues in this way, it will only continue to grow bigger and better. Its Flea and Tick Prevention for Cats uses natural ingredients to keep ticks and fleas away from your pet. If your cat is already infested, you will have to treat it to remove the parasites first before using this collar. It is only meant to repel fleas and ticks, deterring them from attaching to your beloved pet. The collar is quite easy to wear. Just place it around your cat and adjust with the buckle till you get a snug fit that will easily slide around its neck. If you have an excess length of the collar sticking out, you can cut that off. The collar measures a length of 13 inches which makes it suitable for medium to small sized cats. It is reasonable to allow about 2 to 3 inches of space between the collar and the cat’s neck so the collar won’t become too tight as the cat grows. Fleas and ticks are known to generally move upwards towards the cat’s head. When you consider the cat’s movement, the air carries the fortified treatment from the collar through to the rest of the body. This is how the collar offers a covering of protection for your cat. This protection will last up to 8 months under regular conditions. The natural ingredients this collar is fortified with makes it safe for your pet and will not cause rashes not trigger any allergies. It is also waterproof and will not lose strength due to contact with water. The manufacturer indicates that this collar is suitable for dogs too. Since dogs tend to be more allergic, it is important to watch for how your dog reacts to this collar. If you notice unfavorable reactions, take off the collar and visit a veterinary doctor for a checkup. To stay safe, it is recommended to read the entire user instructions. This collar should not be used on kittens under 8 weeks old. You are supposed to wash your hands after wearing this collar on your cat and keep it away from where kids can access it. One of the major selling points for OXO Pet Products LLC is that it makes its products available at a low cost compared to the prices of its competitors. This does not mean that its products are less efficient in any way. Instead, it ranks high on most wholesale and retail pet product sellers’ websites. So, when you purchase any of its products, you will not only be saving some money, you will also be getting a high-quality product as well. This vested trust is what you get with the Natural Waterproof Flea Prevention Collar. As prevention, they say, is better than cure, this collar helps to keep your cats from flea and tick infestation. Good news is that though it is made for tick and flea prevention, it also repels mosquitoes, lice, and larvae. So, if the larvae die, there is no chance of continuity of the insect on your cat. Let’s talk about its convenient use. No, you don’t need to read a manual to learn how to use it. It’s as simple as open the package, place over your cat’s neck, adjust to the cat’s neck size leaving about 2 inches allowance and buckle. You may decide to cut off the excess length. This will help the collar roll around the cat’s neck without choking. The waterproof nature of this collar makes it fit to be used in any weather condition. Whether indoors or outdoors, in the rain or in the snow. Your cat can even swim with it without any fears of it ripping apart or getting soaked. However, if the cat gets wet with it frequently, you may need to change it more frequently. 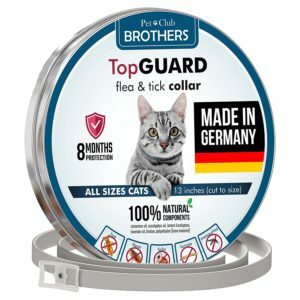 If you have ever had concerns about whether this collar will itch your cat’s skin, you have nothing to worry about because this collar does not cause any irritation. It even has a nice citrus smell that comes with it, so it’s comfortable for both you and your cat. You know the best part? With this collar, you wouldn’t have to keep marking the calendar and checking when next you are going for your vet’s appointment for flea treatment. All that is required is to mark the date you wore the collar on your cat, 4 months from that day, you just simply change the collar. But you must ensure that your environment and pet have been treated for fleas and ticks to get maximum result from using this collar. When you find a brand with a reputation for excellent service all through its many years of existence, you have found a rare gem. Such can be said of Anion. It has produced a wide range of products ranging from pet products to personal care products. And one outstanding feature of its products is the high rating they get. Anion is committed to creating products that exceed its customers’ expectations. According to their brand statement, it ensures that everyone who uses its products does so with peace of mind. Wouldn’t you want to deal with such a brand? 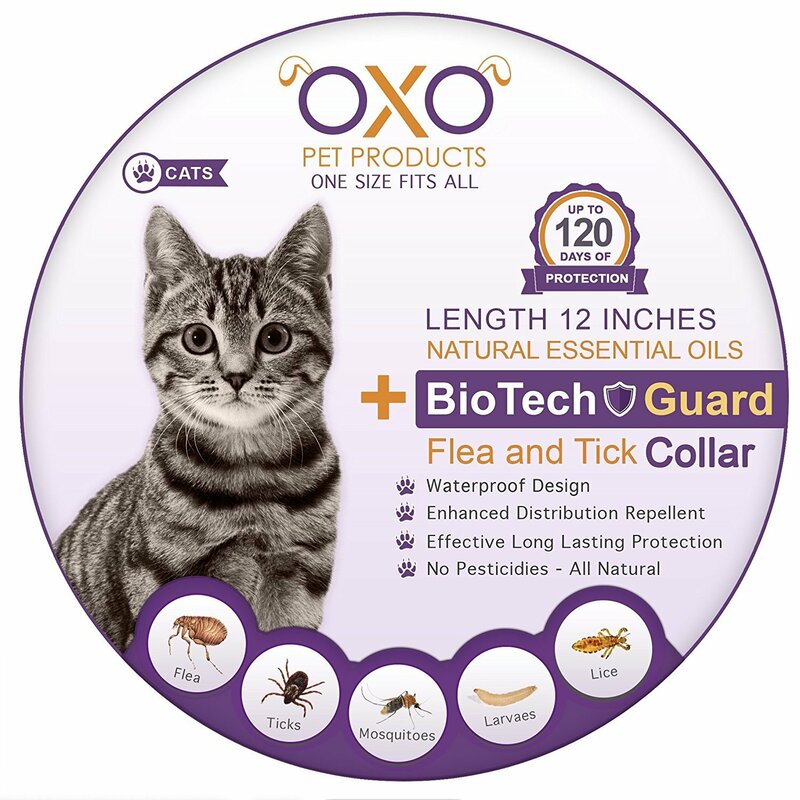 The Flea Tick Collar for Dogs and Cats is one product made to serve many clients. It can be used on both cats and dogs and it is also effective for preventing 5 different pests from infesting your pets. On opening the package, it smells more like lemongrass and this is quite pleasant to both the pet and its owner. This also means that it is allergen-free. Your kitty can use it without fear of reactions or itching. It is all-natural. The collar is so easy to use that even a child can strap it on. There are no buckles and no complicated fittings. What you have is a pre-shaped strip which goes around your pet’s neck and stays. If the extra length is a problem for you, you can cut it off and have just the length of your pet’s neck. This also means that this collar can fit any size of a cat that you have. Well, it’s one-size-fits-all. Your pet can get to play anywhere, anytime and under any condition because this collar is waterproof. You wouldn’t have to remove it every time your pet needs to get out in the rain or snow. 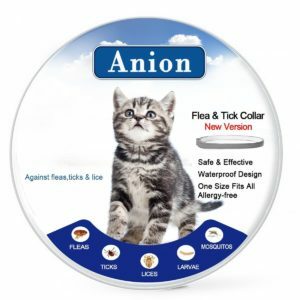 If your worry has been whether your child can still play with your pet while it is using this collar, rest assured, Anion heard you. Due to its allergen-free nature, this collar is also kid-friendly. So, your child and pet can remain best friends and play all they want. Are you always looking at your calendar to be sure you don’t miss your monthly flea treatment at the vets? Let’s just say that you can now breathe easy. With this collar, it’s eight months of not looking at a calendar (at least, not for a flea treatment appointment). That’s almost a year! Now that you have gone through our list of flea collars for cats you can trust. You can now confidently go ahead and make a choice that is most suited to your needs. 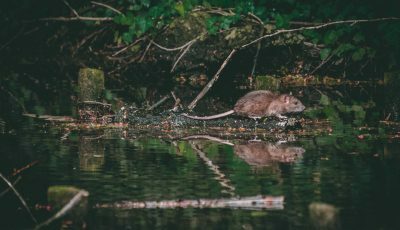 How to give your pet a flea bath?